The Serbian delegation led by the Minister of Youth and Sport Ms. Alisa Maric paid five-day visit to Azerbaijan, during which met with the Minister of Youth and Sport of the Republic of Azerbaijan Mr.Azad Rahimov. The discussion was focused on the improvement of bilateral cooperation between two countries. The Serbian delegation will visit the National Olympic Committee, Flag Square, Baku-2015 Athletes Village, Azerbaijan Youth Foundation and a number of sports centers. 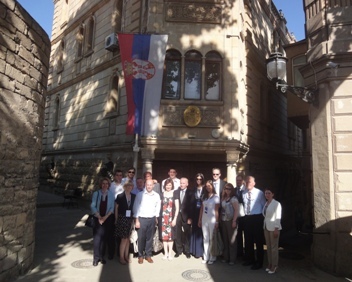 Chargé d’Affaires of the Republic of Serbia to the Republic of Azerbaijan, Counsellor of the Embassy Mr.Milanko Bajceta welcomed the Serbian delegation in historical heritage UNESCO the old Town – Icheri Sheher, where the Embassy building is located.